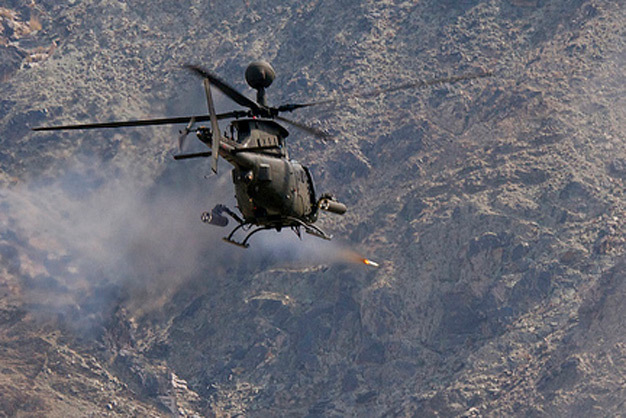 An OH-58D Kiowa Warrior from Task Force Saber, 82nd Combat Aviation Brigade, fires a 2.75-inch rocket at a mountainside during a test flight in eastern Afghanistan, March 2, 2012. The Kiowa warrior is the Army’s scout and reconnaissance aircraft, which often provides close support for ground troops on the battlefield. Saber’s Kiowas lead the 82nd Combat Aviation Brigade, which has flown more than 65,000 hours across all airframes since October 2011. US Army photo by Sgt. 1st Class Eric Pahon, Task Force Poseidon Public Affairs.